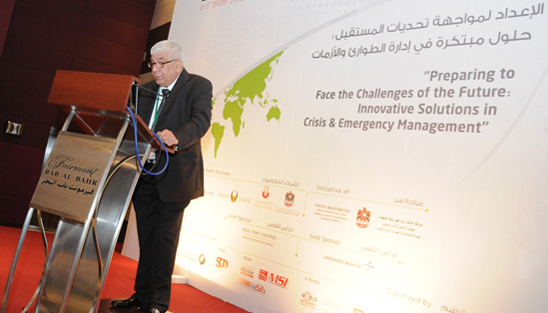 Launched in 2008 by the National Emergency Crisis & Disaster Management Authority (NCEMA) the Crisis and Emergency Management Conference (CEMC) returned to the Fairmont Bab Al Bahr Hotel in Abu Dhabi on January 16-17, 2012 with its third edition (CEMC 2012). 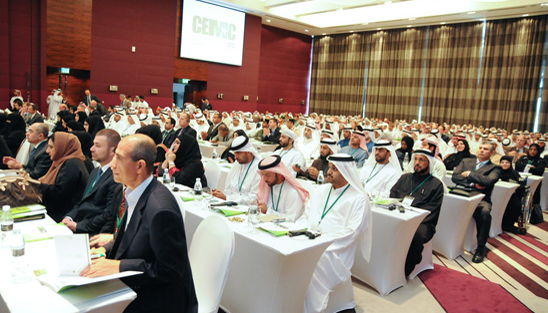 CEMC 2012 was organized by the Institute for Near East & Gulf Military Analysis (INEGMA) for the very first time and reflects the consolidating position of INEGMA as the leading organizer of high-level conferences in the UAE with a multiplicity of government partners. 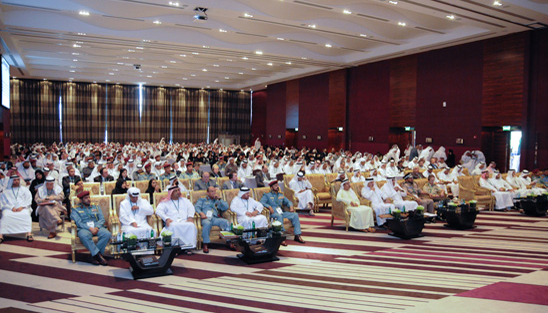 On its first day, the conference gathered around 600 participants and around 450 participants on its second day. 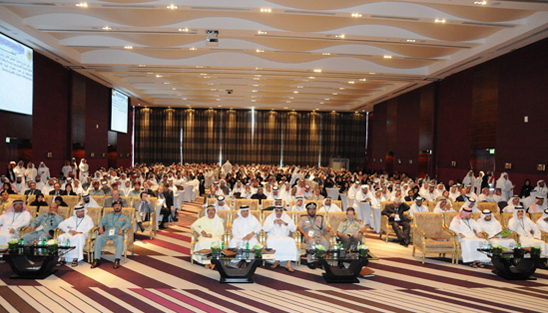 The conference raised awareness and educated national crisis management communities and their partners in the UAE and GCC of the systems and processes to be employed during potential crisis scenarios. 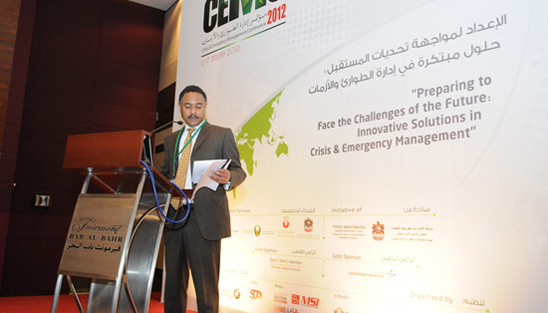 By drawing on expert insights from thought leaders and subject matter authorities from around the world, CEMC 2012 kept its participants at the cutting edge of the conceptual and practical aspects of responding to a plethora of potential large-scale emergency situation challenges. The CEMC 2012 agenda explored the following topics: Measuring Success in Coordinating Humanitarian Relief Operations- Latest Lessons Learned, Managing Natural Disasters; Challenges and Lessons Learned, Responding to An Escalating Crisis – Lessons Learned from Australia’s Flood Response in 2011, National Emergency Plan for the Telecommunications Sector, Measuring Resilience - Community Subsystems and their Ability to Withstand Disasters, Mechanisms to Measure the Effectiveness of Crisis Response Plans, Hyogo Framework for Action 2005-2015: Building the Resilience of Nations and Communities to Disasters, Crisis Management of Korea's Nuclear Power Plants, The Role of Numerical Models in Predicting Natural and Nuclear Disasters, Effective Urban Search & Rescue- Capitalizing on Interoperable GIS Technology, The Role of Information in the Current Operating Environment, UAE's NSDI and its Applications in Emergency and Disaster Management, Understanding the Evolving Role of Social Media in Crisis Management, in addition to two workshops on: From Hurricane Katrina to Deep-Water Horizon: Managing Catastrophic Events through Unity of Effort and Facilitating Greater Business Continuity Planning through Enhanced Public-Private Sector Co-operation. 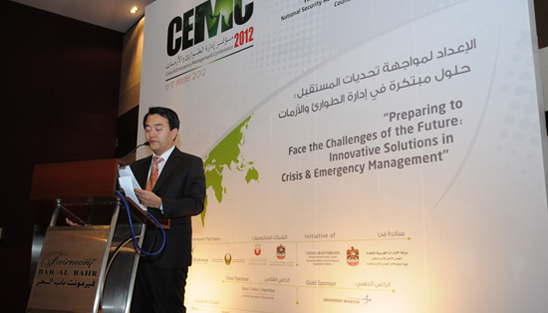 CEMC 2012 succeeded in delivering the latest insights on international best practices informed by lessons learned from recent operations to assist in the alleviation, preparation, response to and recovery of emergency situations. A number of networking sessions at CEMC 2012 further enabled peer-to-peer discussion amongst the crisis and disaster management community at the international level to enable global perspectives on issues of professional interest. CEMC is an initiative of National Crisis & Emergency Disaster Management Authority (NCEMA) that began in 2008. 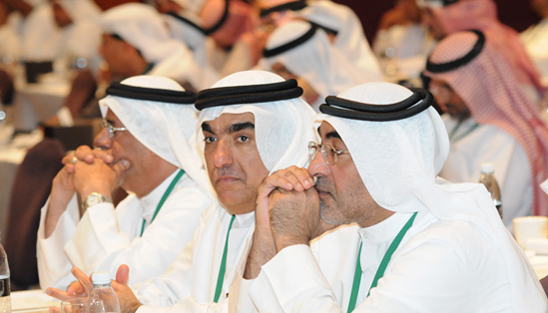 CEMC organizers typically work closely in association with the Ministry of Presidency Affairs and Critical National Infrastructure Authority, as well as enjoying support from government agencies such as Health Authority - Abu Dhabi, Dubai Customs, Telecommunications Regulatory Authority, and the Emirates Center for Strategic Studies and Research (ECSSR) at past editions. Under the Prestigious Patronage of His Highness Sheikh Hazza bin Zayed Al Nahyan, National Security Advisor and Chairman of the National Emergency Crisis & Disasters Management Authority (NCEMA) Board of Directors, NCEMA proudly announced the opening of the third edition of the Crisis & Emergency Management Conference - CEMC 2012 organized by The Institute for Near East & Gulf Military Analysis, INEGMA on January 16 – 17, 2012 at Fairmont Bab Al Bahr Hotel in Abu Dhabi, UAE. 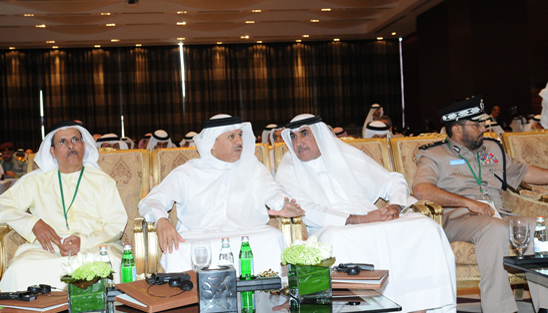 CEMC was attended by His Excellency Abdul Latif Bin Rashid Al Zayani, Secretary General of the Cooperation Council for the Arab states of the Gulf and His Excellency Seif Sultan Al Iryani, Secretary General of the National Security High Council, in addition to international senior high-level government officials from the UAE, the Gulf and abroad as well as high-level military officials, decision makers, industry partners and NGO’s in addition to security specialists from the UAE, the GCC countries, USA, European Union, Asia and the Arab countries to discuss and share insights into emerging best practice in organizing and preparing for, alleviation, response and recovery in the face of emergencies and disasters. Brigadier General Dr. Reda Btoush, Vice President of the National Centre for Security and Crisis Management at the Hashemite Kingdom of Jordan – NCSCM gave a presentation behalf of H.R.H. Prince Ali Bin Al Hussein, NCSM’s Chairman about the Center’s history, vision and aspirations. 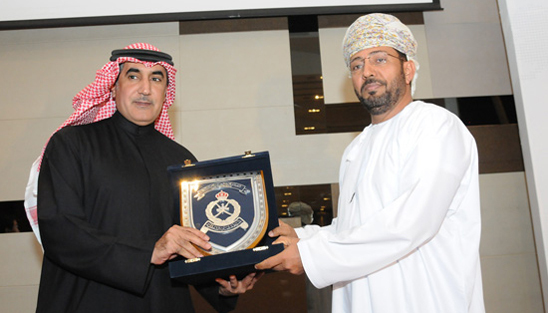 Mr. Ali Rashed Al Neyadi, NCEMA’s Operations Department Director presented NCEMA’s progress since 2010. 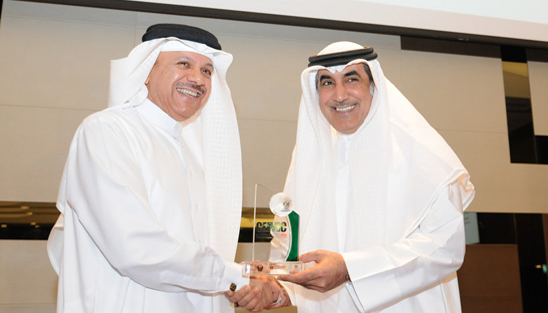 He presented NCEMA’s objectives since its foundation until today and emphasized on the steps that lead to the Authority’s foundation as well as its achievements. Al Neyadi also discussed the preparations made by the Authority to face any emergency or crisis that might occur, in addition to the coordination between all emirates of the government in the field of crisis and emergency. 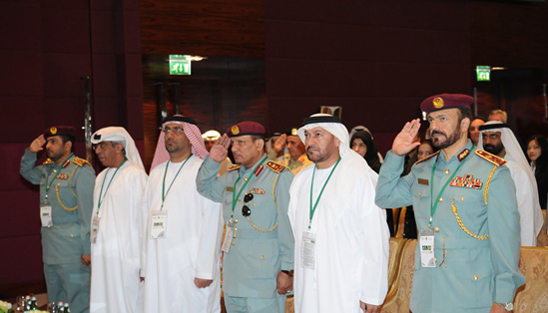 The First Plenary Session chaired by Major General Humaid Mohammed Al Hudaidi, Sharjah Chief of Police featured three speakers. Finally, Colonel Philippe Nardin, Head of the International Relations Missions at the Civil Protection Directorate, Civil Defense and Public Safety Direction in France, lectured about: “Mechanisms to Measure the Effectiveness of Crisis Response Plans.” In his presentation, Colonel Nardin treated the everyday life citizen’s risks, natural disasters, hazmat disasters, health risks and other related threats. The first day of the conference ended with two specialized closed workshops. The first workshop treated: “Managing Catastrophic Events through unity of effort from Hurricane Katrina to Deep-Water Horizon.” Presented by Admiral (Ret.) Thad Allen, Former Commander of the United States Coast Guard. The second workshop treated: “Facilitating Greater Business Continuity Planning through Enhanced Public-Private Sector Cooperation, presented by Mr. Alan Berman, MBCP and President of the Disaster Recovery Institute International - DRI in the USA. 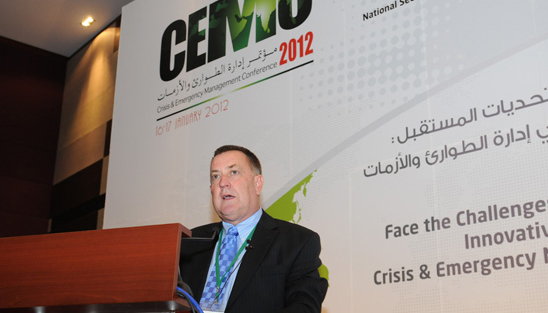 CEMC 2012 will resume tomorrow, Tuesday the 16th of January, with two plenary sessions about Crisis Management Coordination and Cooperation and the Information Environment. 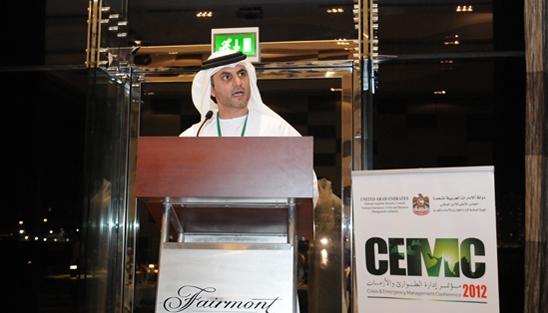 CEMC 2012 Government partners were: Ministry of Presidential Affairs, Telecommunications Regulatory Authority, General Headquarters and Emirate of Abu Dhabi, Executive Council General Secretariat. 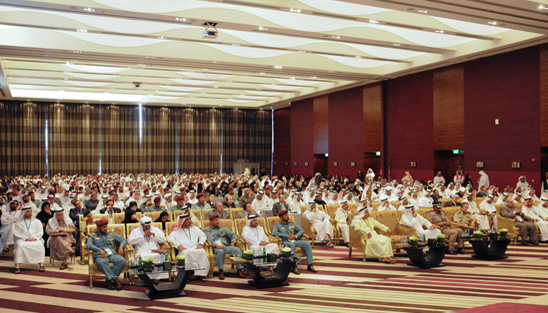 The first day of the conference ended successfully and was followed by a glamorous gala dinner at Fairmont Bab Al Bahr. 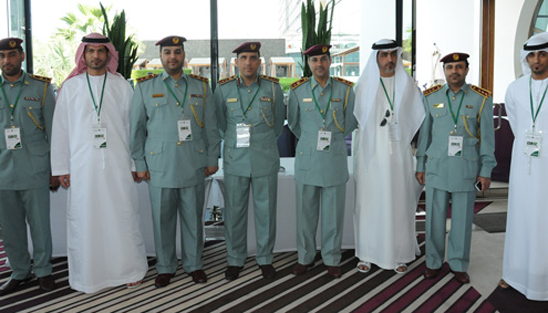 Under the Prestigious Patronage of His Highness Sheikh Hazza bin Zayed Al Nahyan, National Security Advisor and Chairman of the National Emergency Crisis & Disasters Management Authority (NCEMA) Board of Directors, The Crisis & Emergency Management Conference – CEMC proceeded its activities for the second day in the Fairmont Bab Al Bahr Hotel, Abu Dhabi. 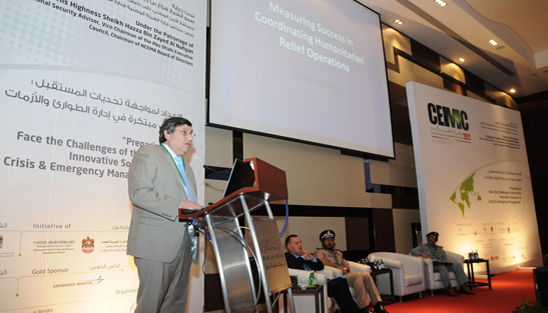 The conference was organized by the Institute for Near East and Gulf Military Analysis – INEGMA, commissioned by the National Emergency Crisis & Disasters Management Authority – NCEMA. CEMC participants conveyed their gratitude and appreciation to His Highness Sheikh Khalifa Bin Zayed Al Nahyan, President of the United Arab Emirates and His Highness Sheikh Mohammed bin Rashid Al Maktoum, Vice President and Prime Minister of the UAE, and Ruler of Dubai and His Highness General Sheikh Mohamed Bin Zayed Al Nahyan, Deputy Supreme Commander of The UAE Armed Forces and Crown Prince of Abu Dhabi for their continued support and to all those who supported the conference which has resulted into great success and came out with important positive results. Participants also conveyed their thanks and gratitude to His Highness Sheikh Hazza bin Zayed Al Nahyan, National Security Advisor and Chairman of the National Emergency Crisis & Disasters Management Authority – NCEMA for his patronage and follow up on the conference activities. 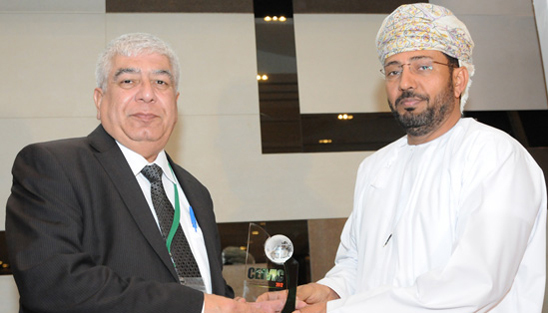 NCEMA expressed its appreciation to all participants for all the efforts deployed and the presentations they have made, announcing the fourth edition of CEMC in 2014. 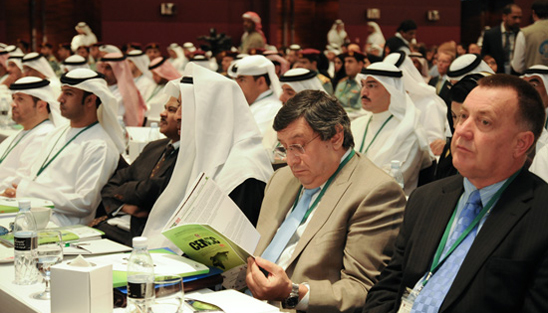 The set up of a unified Gulf System to manage emergencies, crisis and disasters, develop unified strategies and plans, in addition to methods of standardized training and organization of joint exercise using similar tools to face any crisis or disaster that might occur in any government in the region, thus exchanging expertise in confronting crisis and disasters. The importance of the civil society institutions’ participation to include NGO’s and educational institutions in all strategies and plans related to emergency, crisis and disasters. The need to deal with members of the community with full transparency and honesty on all levels to include all kinds of cultures during emergency, crisis and disasters. 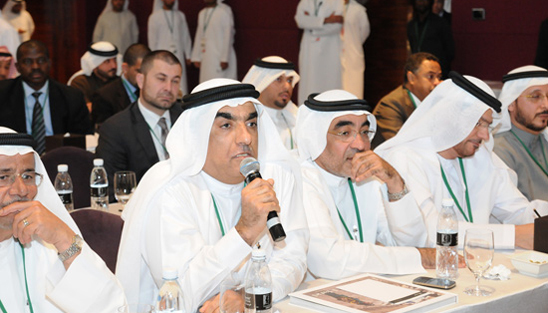 The second day of the conference started with a keynote speech delivered by Dr. Abdulaziz Yusuf Hamza, Chairman of the GCC Emergency Management Centre followed by two plenary sessions. Dr. Hamza stressed on the importance of preparing plans to deal with the challenges faced by countries in the region, notably the Arab-Israeli conflict, the spread of nuclear weapons, the conflict for control of the vital waterways, the scarcity of food and water, technological war and other related challenges. Gold sponsor: Lockheed Martin, Silver sponsor: Booz Allen Hamilton. 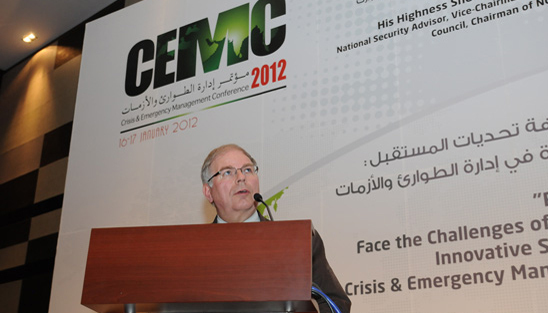 CEMC 2012 concluded with enormous success.